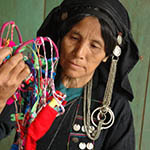 Click the button below to add the Ethnic minority necklace handmade in Yunnan to your wish list. This extraordinary and vibrant necklace is so eye catching that we challenge you to be bold and be different. It will really stand out in a party and is guaranteed to start a conversation (about ethical shopping perhaps? ).